Frames can be used in a variety of sizes from 1000-1800mm. Rectangle and radials possible. Choice of top finishes. We can use new tops for large range of finishes. Beam has integrated cable management. 800 and 600mm deep legs. Can be configured as runs of desks with shared legs which saves money. 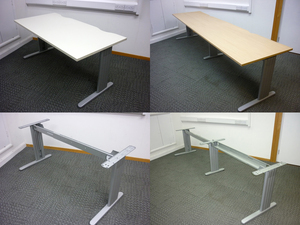 Basic 1200-1600mm desk with secondhand top - £100+VAT each. Run of two sharing legs - £150+VAT. Can do new tops 600-800mm deep.